Luxuriously long, luscious lengths with just a hint of textured wave fall from a fashionable centre parting down the back and tumble around shoulders and chest. Shown here in rich Dark Chocolate Mist colour, the Meghan wig is inspired by Meghan Markle, soon to be married to Prince Harry at the wedding of the year! 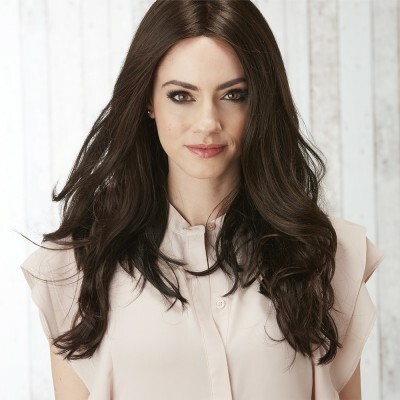 The Meghan wig includes a Monofilament Part, Lace Front and Comfort Cap Base for a lightweight, ultra-natural fit. A Monofilament Part creates the illusion of realistic, natural looking hair growth at the top centre parting - just where it is most effective. The Lace Front gives the appearance of an invisible hairline enabling this gorgeous style to be worn back from the face if you require. A Comfort Cap Base offers a lightweight, comfortable and secure fit for your peace of mind all day long. High grade Synthetic hair fibres create a glossy, high shine and easy to maintain style - perfect for those of you who are on the go and want to look and feel beautiful!